A friend from church asked me to help her work with the students at the local Christian school sew items for a fund raiser that they are having at the end of February. She wanted some "duffle" or tote bags. Here is a photo of what I found. 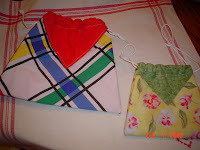 The smaller flowered bag was a sample I made up from a pattern I found yesterday at a quilt store. The plaid bag is a little bigger and is made out of tons of material I found for the project. I will take them to church tomorrow to see if they are what she wants. I will have to find lining fabric to go with the plaid - not too hard because of all the colors in the plaid. This bag is rather cool because it is simply paid out of two squares of fabric. Then, you turn the square "on point" and fold like an envelope. The inside folds made "pockets". The outside folds allow you to sew a casing to allow for the cords to be eased through to draw the bag closed. We are going to use shoe strings for the cords as the ends have those plastic tips that should allow for easy insertion into the casing. The smaller bag was a 9-inch square. The plaid bag was a 27-inch square. What do you think?